Cape Breton Island: Talk about Good Stuff! Crustacean Celebration: Crab Niçoise, Anyone? Jooooolia! Top Writers Share Memories. 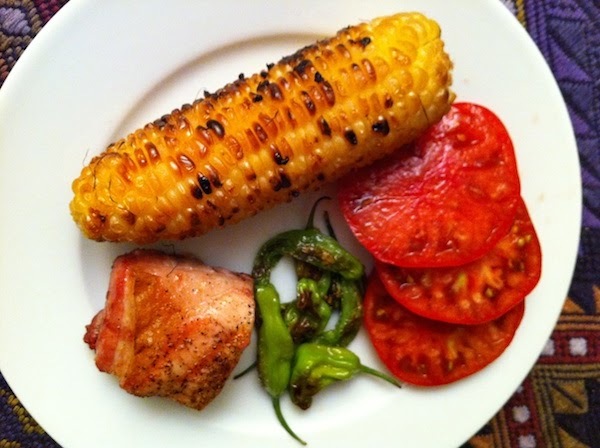 Couldn't resist posting this: grilled local organic corn, garden tomatoes (Purple Cherokees, if you must know), pimientos de Padrón and…awesomeness itself…grilled pork belly. Truly and insanely delicious! We leave town for a week and suddenly it's tomato season! Can't ask for better timing than that, especially since a couple of years ago we left for a few days about this time of year and got a panicky call from our son, who was housesitting for us and had just collected a bushel of ripe tomatoes from the garden. "No problem," we said, sensing this was a perfect teachable moment. "Get a big pot, chunk up the tomatoes and simmer them over low heat. You'll have sauce in no time." I've run the recipe below before, which is based on a Mark Bittman dish from his Minimalist days, but it's one of our all-time favorite, go-to weeknight dinners. And there's no better time to make it than when cherry tomatoes are popping out of the garden and flooding into farmers' markets! While water is heating, heat olive oil in large skillet over medium heat until it shimmers. If using salt-packed anchovies, rinse and dry on a paper towel and proceed as with tinned anchovies. If using tinned anchovies, add without draining to skillet and sauté, breaking them up with a spatula until they dissolve (watch out for splattering). 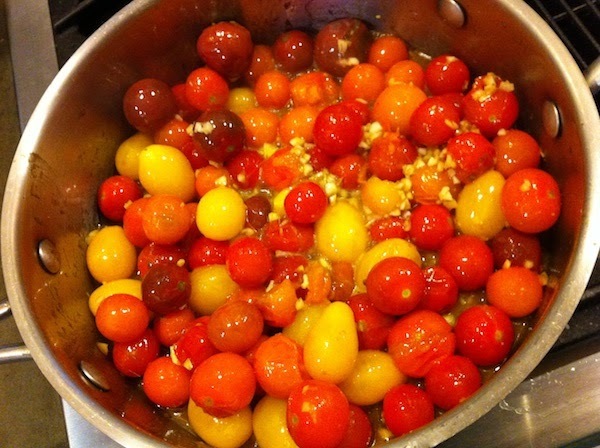 Add garlic and heat briefly, then add cherry tomatoes and reduce heat to simmer. While tomatoes cook down, add pasta to boiling water and cook till al dente. 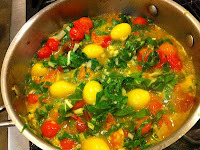 While pasta cooks, add greens, if desired, to skillet and let them wilt. 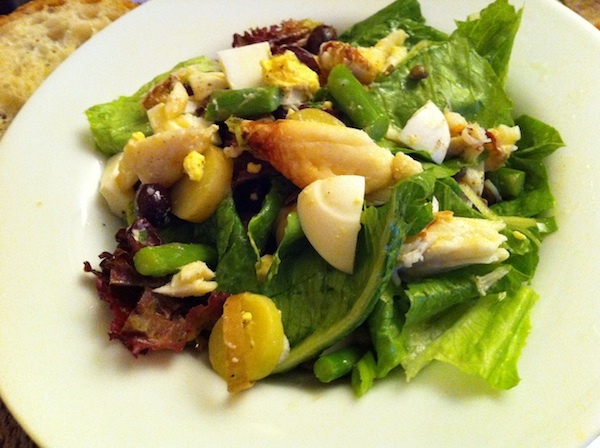 (To me, adding the greens makes a one-dish dinner, but it'd also be great with a green salad and bread.) Add salt and pepper to taste. When pasta is cooked, drain and put in serving bowl. Pour tomato mixture over top and toss gently. Sprinkle with cheese and serve more on the table. 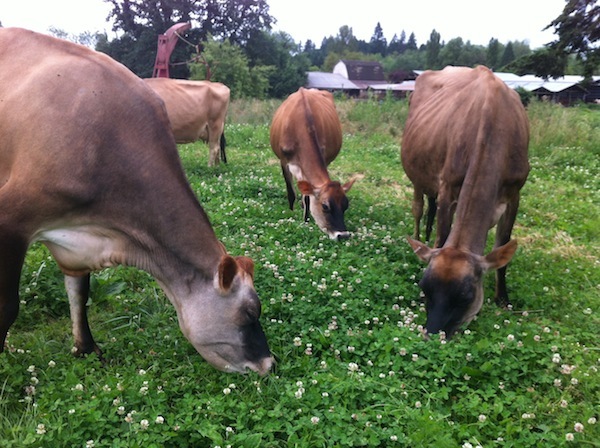 "Diversifying my markets as a farmer has really helped me keep a cash flow coming in," said Theresa Draper of Draper Girls Country Farm in Parkdale, Oregon. The second part of my interview with Theresa explores how she expanded her business from selling fruit at the family's farm stand to offering a u-pick option, and how she developed value-added products like cider, dried apples and jams. From there she started vending at farmers' markets, added a farm stay in the old family farmhouse and even sells the meat from her lambs. Watch Part One of my interview with Theresa Draper of Draper Girls Country Farm. Read more about her and her farm. When one thinks of the residents of a farm, humans undoubtedly come first to mind. But other inhabitants, like animals, birds and insects, must also be counted, particularly when the farm uses organic methods. Few, though, are as critically important as the humble bumblebee. 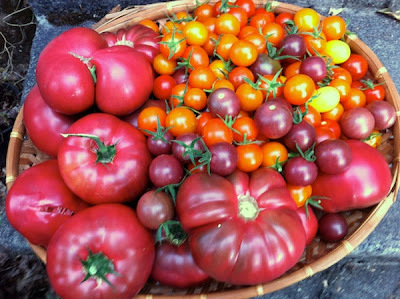 Contributor Anthony Boutard of Ayers Creek Farm sings its praises. It is late summer and, as usual, members of Hymenoptera—the insect order that groups together the wasps, bees and ants—are putting on a show. 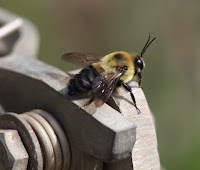 About two weeks ago, a large cohort of male bumblebees emerged. Fidgety and playfully pugnacious, they fly about just inches above the ground, darting here and there, trying to stay out of reach of any remaining barn swallows seeking a quick snack on the way to Capistrano. Their shape, coloration and behavior is very different from the females of the colony—the queen and her daughters, the workers. The males do not have a stinger. The male bumblebee develops from an unfertilized egg. In other words, denied sperm, an egg paradoxically yields a male. Fatherless male offspring is one of those peculiar twists that makes the Hymenoptera so interesting. Both the queen and her sisters can produce eggs, but only the queen has mated and produces fertilized eggs which develop into the females of the nest. The sperm from her nuptial flights is held in a special organ, and the eggs are fertilized as they are laid, or not in the case of males. Typically, the males appear toward the end of the colony's existence and may have hatched from an egg laid by either the queen or one of her daughters. Despite their aimless flight pattern and endless tousling with their brethren, the males are ever alert for the emergence of a newly hatched queen, or gyne as entomologists call her, and the opportunity to mate with her. (Photo at top shows a Brown-belted bumblebee queen or gyne emerging from the nest hole.) Apparently, the males identify her by sight, not a chemical cue, which may explain why a hapless swallow-tail passing through earlier this week found itself mobbed by amorous bumblebees. Discovering this lek of bees, we shared with the males a keen interest in seeing the queens emerge, pausing to survey the area as we passed at various times during the day. The nest is in an old mouse hole in the heavily traveled lane between the blackberry fields. Monday the show began. The new queens are genetically the same as the worker sorority; there is no special queen gene. They are raised in larger wax vessels than the workers, and they are fed more food during the larval stage. In order to survive the winter and a summer of laying eggs, a more robust body is needed. After emerging from their pupae, these large females linger in the nest and fatten up for a few days. They emerge from the nest, mostly individually, groom themselves and then take flight. In seconds, the males converge upon her and, in an airborne scrum, try to do the honors. Once a coupling occurs, the surplus males drift back to their posts and the job is finished on the ground. After mating, the queen quickly seeks shelter. She mates more than once and, well-provisioned with sperm, she will spend some time building her fat reserves for the winter hibernation. If all goes well, she will emerge from her hibernation lair in the spring and start a new colony. 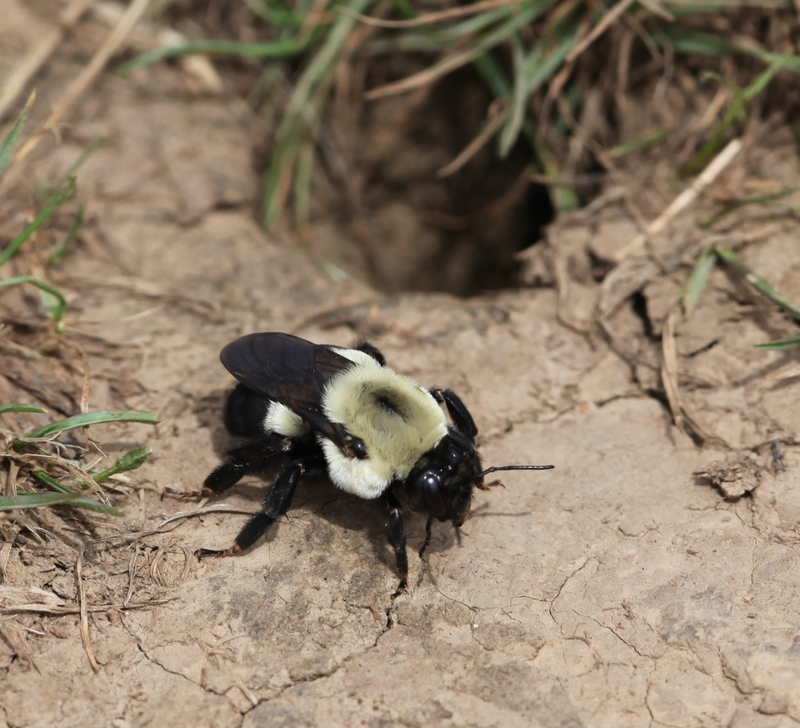 We have at least four bumblebee species on the farm: the white-shouldered, black-tailed, yellow-faced and the brown-belted—the latter are the queens emerging this week. The scientific name is Bombus griseocollis and translates into "bumblebee with a pearl-grey neck," probably referring to a fine line of hairs that encircle the neckline of the females. The brown belt of the English name refers to a distinct band of brown hairs on the second abdominal section of the males, just behind the wings. (Photo at left, above, shows a Brown-belted bumblebee, Bombus griseocollis, male drone waiting for his gyne.) The newly emerged gyne is very beautiful. Her coat is much lighter than the male's or worker's. Interestingly, the male brown-belted bumblebees darting about are not merely callow Lotharios; it is one of four bumblebee species where the males actually assist in the nest by incubating the brood, an important task. The bumblebees can be difficult to identify, prompting one entomologist to call them "morphologically monotonous." The key distinguishing characteristic are differences in the male genitalia, perhaps prompting this observation. Fortunately overall appearance is sometimes enough, and Rich Hatfield at the Xerces Society identified the bee for us from a photo. Xerces is based in Portland, and is internationally recognized for its efforts at invertebrate conservation. They have produced many useful publications, both in print and online, and issue a quarterly magazine called Wings. Xerces is a very important and well-run organization. Here's a brilliant idea: Ten well-known international chefs team up with ten local chefs to cook up a series of dinners, each one featuring the very best of the area's bounty. Not only that, but each dinner takes place at a spectacular local destination (Top photo: Dinner Under the Stars overlooking Bras d'Or Lake). 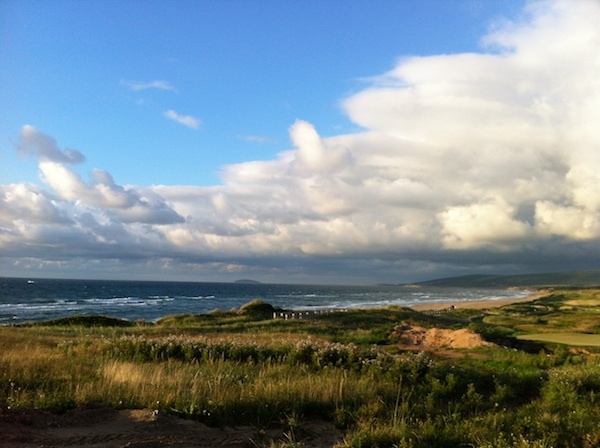 Outdoor dinner on the beach at Cabot Links, Inverness. Get it? 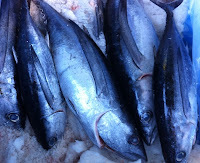 The visiting chefs experience ingredients right from the source and meet the people who grow it, fish it or produce it. In some instances they'll actually help with the harvest of a featured ingredient. Plus they get to collaborate in creating dishes with the men and women who work with these ingredients every day, not to mention the brewers, winemakers and distillers who turn grapes and grain into liquid magic. Ocean perch ceviche at Bras d'Or Lake. The local chefs get to express their passion for the region and its incredible producers, and work side by side with chefs from other places, sharing ideas and inspiration, creating dishes that meld the best of both worlds. And joining them are ten "aspiring" chefs who have been chosen from essays they wrote about why they wanted to participate in the event. Well, if it sounds like it could only happen in a place as special as the Pacific Northwest, you'll have to think again. Because that's exactly what Pearleen Mofford did when she started the Right Some Good culinary festival in Cape Breton, Nova Scotia. 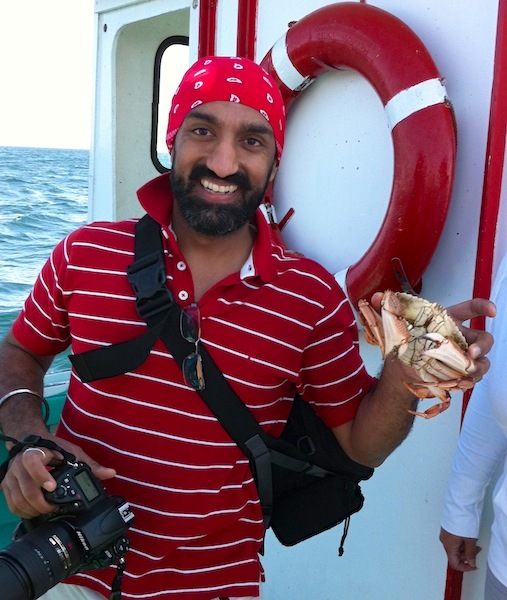 Chef Surjan Jolly of the Renaissance Marriott, Mumbai, with rock crab. 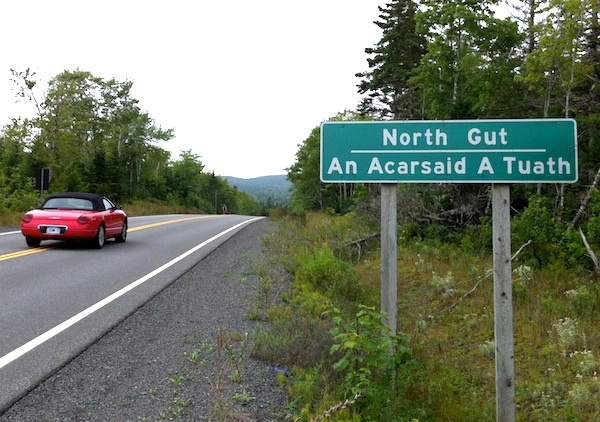 A relatively small island off the western coast of the peninsula that makes up the bulk of the province, it is home to just 100,000 resident. But the seafood that is fished off its coastline, including lobster, haddock, snow crab and ocean perch, is getting big notices across the world in no small part because of the festival, which just finished its second year. 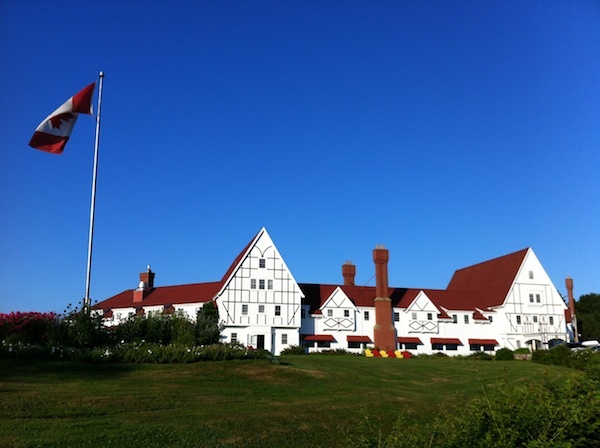 Restaurant Take-Over at the Keltic Lodge, Ingonish. With a booming fishing industry and a nascent artisan agricultural movement that's shaping up to be the next big thing for the island, this year's festival boasted that 80 percent of the ingredients used were from local sources (up from 65 percent its first year). 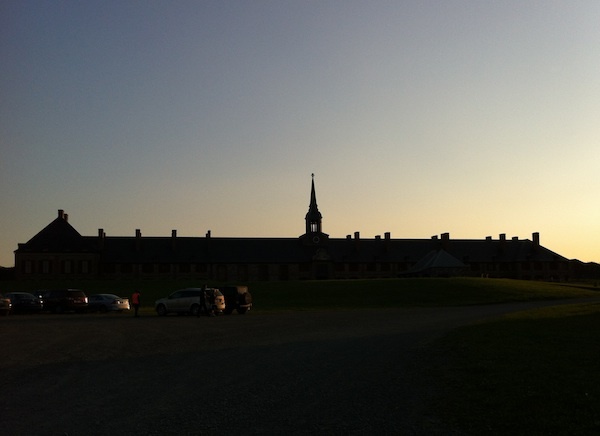 Candlelight dinner at the Louisbourg Fortress. The festival draws not just international chefs, but travelers from around the globe who come for the event and stay to tour the island, then go home to share the amazing experiences they've had. There are also a host of media people who are brought in to taste and tour, and I was lucky enough to be one of those at this year's event, attending four dinners and meeting farmers, fishers and producers from around the area courtesy of Tourism Cape Breton. And the name Right Some Good? Even it's a nod to local, being one of the superlatives islanders use to denote quality, starting with "good," "some good," "right some good," and "right some Jesus good." My opinion? I'd say that next year's festival deserves the latter descriptor. Read the other posts in this series: Arriving in Nova Scotia, The View, Redux, Stirrings of an Artisan Economy and A Forager Finds Home. In this interview for Food Farmer Earth, I talk with Parkdale farmer Theresa Draper of Draper Girls Country Farm about why she finds it so much more satisfying having people harvest their own fruit from her orchards than selling her fruit to a packing plant. Theresa Draper smiles when she talks about growing up among the orchards and fields of her family’s farm outside of Parkdale, Oregon. She remembered loving the feeling of picking fruit right from the trees whenever she wanted, and of helping on the farm driving tractors, changing sprinklers and thinning the fruit. These days she loves sharing the joy of the harvest with the families who come to pick fruit at her Draper Girls Country Farm. Read the rest of my story about Theresa and her farm. In this week's cooking segment, get the goods on three nutritious school lunches your kids will love. To find out more about this series of interviews with local food producers, and to get some terrific recipes featuring the ingredients discussed, consider a free subscription. As we crisscrossed the island over our week in Nova Scotia, the weather improved and we never got tired of this panorama. See our first view of it here. 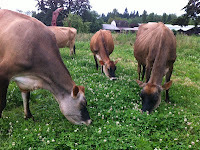 Read the other posts in this series: Talk about Good Stuff!, Stirrings of an Artisan Economy and A Forager Finds Home. We've only just arrived here, but I wanted to share one of our first views of this large island. She's been a bit shy revealing herself, swathed in clouds and fog, and she even tried frightening us with thunder and a drenching downpour our first morning. But as Northwesterners, we know that it'll just take a little patience and she'll see we're not easily discouraged by bad weather. 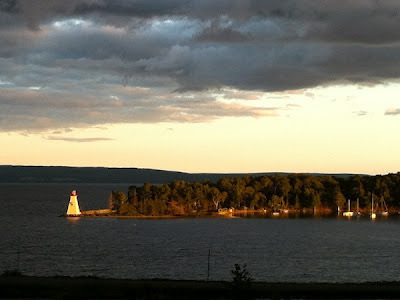 The video above is a view of the Great Bras d'Or channel from the Seal Island Bridge, which connects Boularderie Island and Cape Harris, to where to the channel empties out into the Gulf of St. Lawrence. Oh, and just so you know, "Boularderie" is pronounced buh-LAHR-dee here. And place names are in English and Scottish, as in the sign above. We're definitely not in Kansas. Watch a video of the same panorama in clear weather. 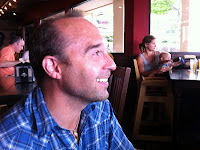 Read the other posts in this series: Talk about Good Stuff!, Stirrings of an Artisan Economy and A Forager Finds Home. Beer geeks love to throw around terms like saison, gueuze and kriek lambic to describe various kinds of malted beverages. But just the other day I tried a bottled beverage I'd never heard of before, called a Radler. It's kind of like an English shandy, short for shandygaff, a beer combined with citrus-flavored soda, carbonated lemonade, ginger beer, ginger ale or cider. Radler, the German word for "cyclist," is a light lager combined with an equal amount of lemon soda. With its low alcohol level (around 2.5% ABV), slight effervescence and thirst-quenching citrusy twang, it's apparently the preferred beverage of those bicycling around the Alps. As averse as I am to flavored beers, I have to admit that from my first tentative sip of the bottle offered to me by the enabling hand of Randy Goodman, I was enthralled. Imagine, I thought. A beer I could enjoy at lunch that wouldn't knock me out for an entire afternoon! Something with a little bit more oomph than lemonade, but with that beverage's refreshing zing. Perfect for a picnic, a barbecue or, gosh, even a bicycle ride! 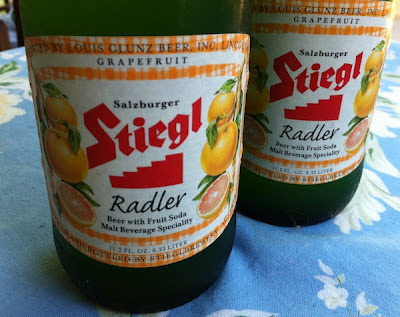 Details: Stiegl Grapefruit (or Lemon Radler). Retails for around $2 per 11.2 fl. oz. bottle. Available at Vino, 137 SE 28th Ave., 503-235-8545; and Belmont Station, 4500 SE Stark St. 503-252-8538. The death of Chavela Vargas earlier this month stirred up memories of our first year working this bench of land above Ayers Creek. We arrived at the farm as capable gardeners with no commercial berry experience. This gap was factored into the purchase agreement. 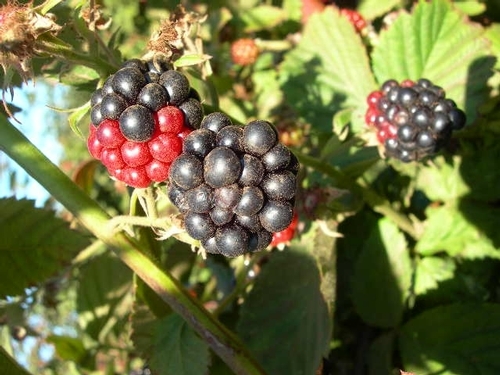 The owners had estimated the value of the annual production of blackberries so we allowed them to sell the crop that year and remain on the farm during the harvest rent-free. The crop value was deducted from the purchase. In exchange, we observed the details of the harvest. It soon became apparent that we would be working with 100 to 200 people, most of whom did not speak English. Nor could we speak a stitch of Spanish. Cri Cri, Francisco Gabilondo, the Singing Cricket. Adopting a variant of Professor Harold Hill's "Think System," we decided we could learn the language listening to Spanish music, assisted by a bit of tutoring. In the manner of young Ron Howard learning the Minuet in G, we would pick up Spanish just thinking about it. We stumbled onto the music of Chavela Vargas first. Her strong, elegant voice tinged with longing brought us the beautiful boleros of Agustín Lara, Alvaro Carrillo and others, filling the car on our way from Portland to the farm every morning. Soon we added Germaine Montero singing the rhythmic and insistent folksongs of Spain and, of course, Mexico's Singing Cricket, Cri Cri. Montero performed in the company of the Spanish poet Garcia Lorca, and many of the songs were transcribed by him. She also recorded Lorca's poems including "Lament on the Death of a Bullfighter." Born and raised in France, her native tongue softened her Castilian Spanish. Francisco Gabilondo Soler was an accomplished singer and composer who is remembered fondly as the children's troubadour Cri Cri. Several months into the think system, a major advance was marked when we realized the refrain of Cri Cri's El Ratón Vaquero was actually sung in English. The following summer it was up to Zenon and the two of us to develop the future character of the field. People working in the field referred to him as both the "row boss" and the "majordomo." Titles are far more important than names in the field, so we asked him what he preferred, and thence forward he was the majordomo. It was in this role that he told us that Anthony, el patrón, needed to go through the field and show them what was expected. The majordomo followed explaining how to pick the perfect berry, seeking the slight dullness and ease of detachment that betrays the fully ripe one. In a nod to the singing cricket, each year that first week became known as "la escuela de la mora" – blackberry school. Just as Cri Cri's English was a bit difficult for us to discern at first, so was Anthony's Spanish to the people in the field. Blank stares demanded a more theatrical effort. Generally, people picked good fruit. If someone was picking poorly, el patrón closed his eyes and reached into bucket where he had spotted the most horrible looking berry. Into the mouth it went, followed by a shudder, an anguished wince and a rapid swallow. "No, no, no, the blackberry is food," he would opine in a sad voice and broken Spanish, "and that one was not yet food. Next week, maybe." Then lapsing into idiom of love learned from the boleros, he would explain that every berry that goes into the bucket should break your heart because you know how delicious it would be in your mouth, yet you must part with it. A giant anglo in white shirt is somehow less imposing when he is relaying the pleasures of eating fruit using the words and cadence of love and longing, with a touch of Cri Cri's humor. For the coda, a perfect fruit was picked, savored for a moment, and in a languid manner el patrón declares "la boca conoce la alma de la mora"—the mouth knows the spirit of the blackberry—followed by a smile of contentment. By the 30th or 40th sour berry, the patrón's shudder and wince were very convincing, yet quickly assuaged by the sweet one that followed. Prior to Ayers Creek, our experience with blackberries was limited to picking them along the field borders on Sauvie Island. Some sweet, some bitter, some sour, some just plain insipid, and all were seedy. 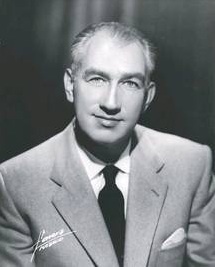 We were listening to Vargas singing boleros when we began our affair with the sublime Chester, and like other songs associated with fond memories, it is hard to separate the two. 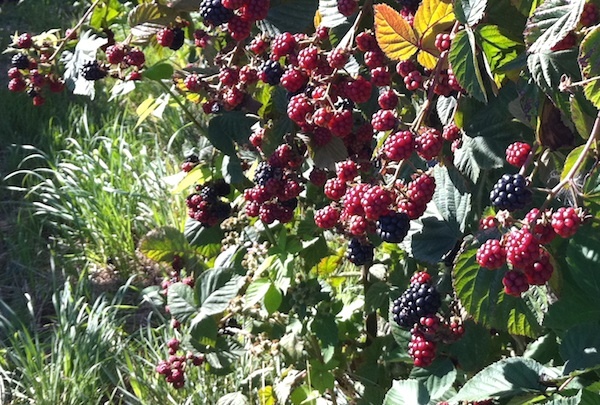 A bolero will never come to mind when contemplating the seedy Himalayan blackberry. Fourteen years later, the field is very different. We stopped selling to Cascadian Farm after 2007, shifting over to fresh market only. Just ten people work for us today, and they carry out a range of tasks on the now diversified farm in addition to the harvest. No more blackberry school. But the character of the field which the majordomo helped us establish that second year hasn't changed, and the desire for a berry that brings a song to mind remains. Upon reflection, it is a good thing that we didn't use conventional language tapes for travelers, or we would have ended up describing the berries in terms of luggage and menu items, or that berry on the right is good, the one on the left is not good. How dull it would have been. Te amamos, Chester. Gracias Chavela. 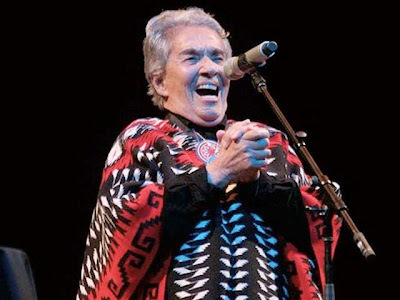 Photo of Chavela Vargas by Elbabirusa (Own work) CC-BY-SA-3.0 via Wikimedia Commons. Photo of Francisco Gabilondo (Cri Cri) by Francisco Gabilondo Soler (GabiSol) CC-BY-3.0, via Wikimedia Commons. 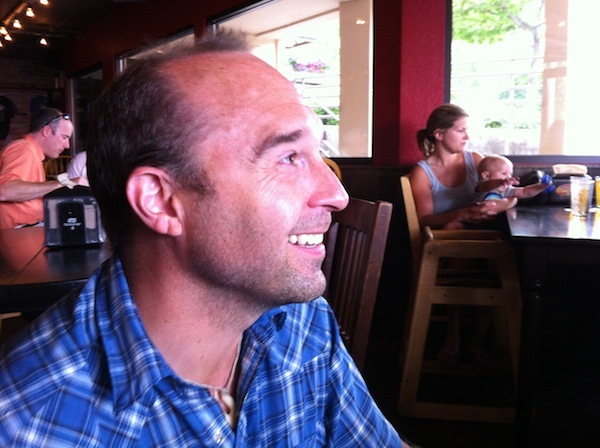 Contributor Anthony Boutard of Ayers Creek Farm speaks out about the temporary ruling allowing canola to be grown in previously protected areas of the Willamette Valley. Why should you take the time to read it? Because understanding issues affecting the integrity of the food we feed our families is important for us city folk, and listening to those closest to the issue, at ground level, so to speak, is one of the best ways to do that. 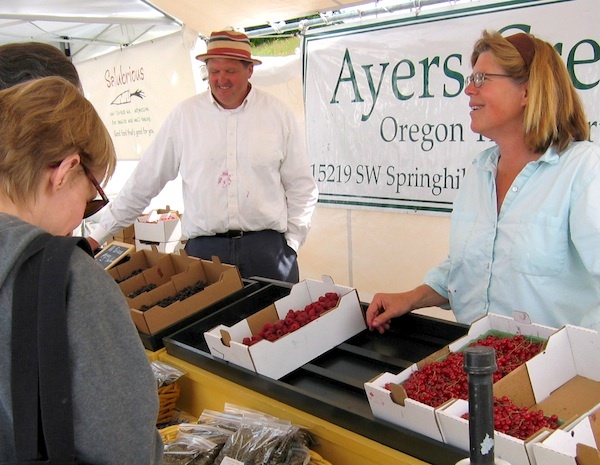 From time to time, we have written about the robust and internationally recognized specialty seed industry in the Willamette Valley. This year, on the north border of our farm is 20 acres of open-pollinated Bull's Blood beet, the subject of a once and future essay. On our western boundary there is approximately 40 acres of hybrid spinach. The beets and spinach are grown for the Danish seed company, Vikima. 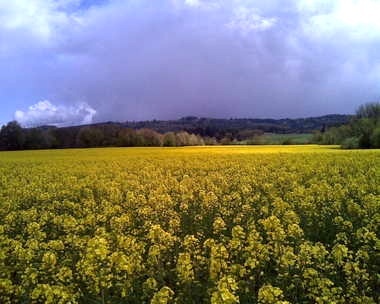 Down the road a ways, there is another large field with radish for cover crop seed. This radish is used by Midwestern farmers to open up compacted soil, improving the soil and saving fuel when they prepare for planting. The crimson clover seed on our southern boundary was harvested last month, and will be planted by farmers to provide organic nitrogen for next crop. The production of synthetic nitrogen requires a huge amounts of natural gas, and is even damaging to the environment when it is applied to the fields. 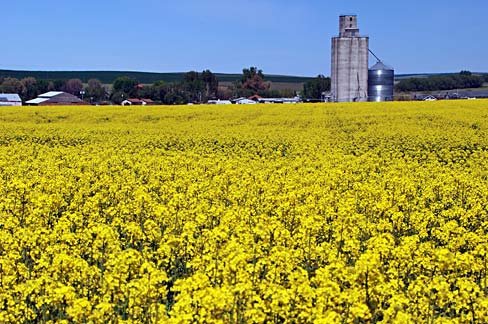 In an effort to maintain the integrity of the valley's seed production, the Oregon Department of Agriculture (ODA) has a quarantine on rapeseed/canola production in the valley. Earlier this month, the ODA announced that it is altering the quarantine on the first of September and issued "temporary rules" developed without public input or hearing. In fact, it was announced during the busiest time of the year for the affected farmers, a really ugly single digit gesture from an agency with "agriculture" in its name. As it would affect our on-farm seed production, we have joined with others in asking Director Coba to suspend the rule. Fortunately, Friends of Family Farmers has gained a temporary stay on the temporary rule from the Court of Appeals. There is a lot of interesting information about the canola issue at the Friends of Family Farmers website [link here]. We have supported the Friends of Family Farmers for several years, and we are deeply appreciative for their willingness to pursue ODA on this terrible and destructive proposal. Deep in its culture, the ODA is a brittle agency that prefers to work behind closed doors with no public input. The agency is riddled with apparatchiks more comfortable in the back room with industry lobbyists than in a public meeting with farmers and consumers. Written without the input of the affected farmers, this temporary rule is a complete mess, imposing on small farms like ours all sorts of unnecessary rules governing our own seed production. They even assert the authority to destroy our seed crop if we fail to comply with all their rules. We need Friends of Family Farmers help and, we are happy to say, they are there for us. In the state fair exhibition of advocates for better farm policies, Friends of Family Farmers would win the treasured tricolor, Best in Show, hands down. They have emerged as a national model for this sort of organization, and when friends ask if you have heard of their director Michele Knaus, you can nonchalantly say you see her shopping at the Hillsdale Farmers' Market, even on the snowy days of winter. No empty rhetoric there. Any support you can give them, moral or money, will be greatly appreciated by us and other family farms. Read the other posts in this series, Oily Process: Canola Needs Closer Look, Canola Controversy Heats Up, More on Canola: Stakeholders File Suit, Despite Decision, It's Not Over, ODA Caves to Canola, "Write Right Now", Seeding Change and Legislature Passes Ban. Top photo of canola field in Boardman, Oregon. It was another one of those nights when dinner inspiration was as rare as a 100° summer day in Portland…um…strike that. It was another one of those nights when dinner inspiration was as rare as a unicycle-riding bagpiper in P…er…never mind. You get the idea. Suffice it to say that we had no idea what would appear on our table that evening, and going out to eat just wasn't in the budget. So we traipsed to the store with the vague idea of grilling something or other. But there, in the seafood section of the case, we spied several very large, very red, very ready-to-eat Dungness crabs. Eureka! 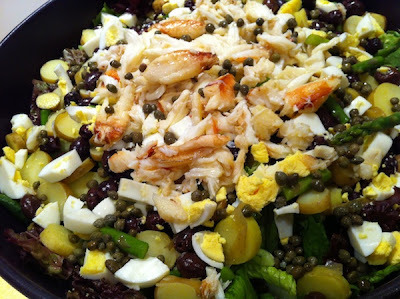 We had the helpful attendant wrap up the largest one, brought it home, picked it clean and scattered it on top of what I'd like to think was a brilliant stroke of genius…crab niçoise! Combine elements and toss. Serve with sliced ciabatta. 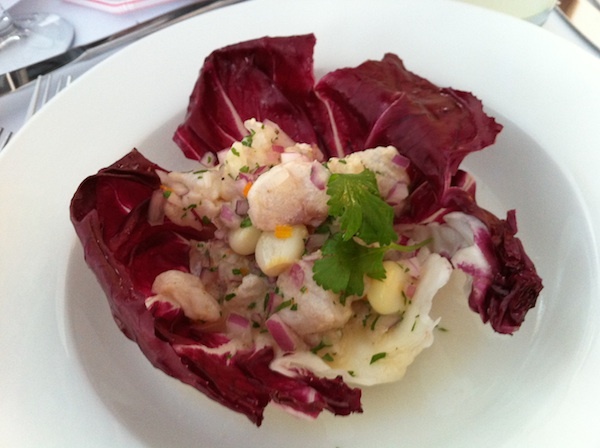 This year's Crustacean Celebration also features a fabulous Crab and Corn Chowder and Beach Cioppino. Read last season's series starting with And They're Off!, and the previous year's series kicking off with a Hot Artichoke and Crab Dip (with links to other posts in the series). Ever wondered what pasteurization is, exactly? In this section of my interview for Food Farmer Earth with Garry Hansen of Lady-Lane Farm, he explains the difference between his method, called vat pasteurization, and other methods. Watch part one of my interview with Garry. Plastic bags, cardboard boxes, rubber bands, twist-ties and other ephemera are part and parcel of farmers' lives, particularly those who sell their goods at farmers' markets. Contributor Anthony Boutard of Ayers Creek Farm recalls one corrugated container he grew particularly fond of. Two weeks ago, the little white box returned after a year's absence. For many years, we have used half-flats made from unbleached container board. Four years ago, we were caught short at the end of the season and bought a bundle of 100 with a white liner board. They were soon gone, and by last year there was just one still in circulation. It stood out in the stack and we commented on how many times it must have returned to the farm. At least five times by the initials, though it might have been more because staff typically initial flats later in the season when mold has set up in the field. That way, if someone is inattentive, we can address the situation quickly. The "ears" on a half-flat box. The flat also had a small oval sticker, indicating that at least once it was filled with Triple Crowns. Those yellow stickers were left over from the days when we grew melons, and we used the extras to mark the non-Chester boxes. Maybe it also went out filled with mirabelles, green gages or festooned with Joe's Long Cayenne peppers, which look just like a jester's hat. Still in good shape after its many journeys, the box was filled with fresh hallocks of Chesters and sent out into world again last week. 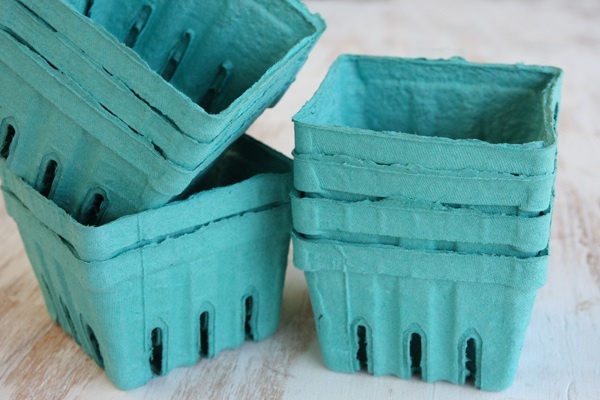 We typically reuse paper flats until they look shabby or their "ears" get mangled—what we call the tabs that lock the boxes together when they are stacked. We never reuse the green paper mache hallocks, however. There are three good reasons why. First, and most importantly, it is a matter of food safety. We do not know where the hallock was stored. Unlike the flat, the hallock comes in direct contact with the fruit, which is eaten raw. From a food safety perspective, it is reckless to reuse the hallock without knowing where and how it was stored. Second is food quality. If there is a speck of mold in the used hallock, that mold will infect fruit put in it later. 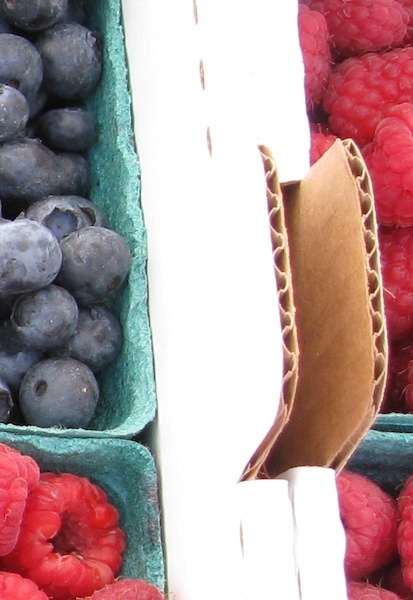 Mold and berries are a match made in heaven if you are into rapid decay. Third, as a matter of federal law, organic growers can only reuse packaging that previously held certified organic produce. Consequently, the used hallocks go to recycling. Hallocks that hold the berries. Packaging is always a fraught subject, especially for organic growers who want to extend the ecological ethic beyond the field. There are many factors that need balancing in selecting how to present the food. For example, on a hot summer's day the delicate greens wilt rapidly, their quality suffers and we waste a lot if they are sold out of an open crate. In the winter, the kale, collards and chicories fare well in the open air. They remain beautiful through the day and sell well. We try to make sure it is always a judgement call rather than a reflexive need to bag. In the valley, farmers are fortunate to have a superb plastics recycling service. Located on Waconda Road in Brooks, Agri-Plas, Inc. recycles a wide spectrum of plastic waste generated by farms. Pots, old irrigation tape, barrels, plastic bags, old twine and grain sacks are all sorted and sold to domestic users. When we have to pick up some supplies in St. Paul, we will carry down our recycling and stop by Ernst on the way home. Very efficient. In the meantime, we will be waiting to see if our little white box returns some Sunday in the future. It is hoped with her ears intact so we can send her forth once more. If you enjoy reading Anthony's missives, you won't want to miss his book, Beautiful Corn: America's Original Grain from Seed to Plate, that is coming out this fall. Pre-order here. You can find Anthony and Carol at the Hillsdale Farmers' Market most Sundays from 10 am-1 pm. In a challenge to the Oregon Department of Agriculture's temporary ruling to allow the planting of canola in previously protected areas of the Willamette Valley, Friends of Family Farmers (FoFF), Center for Food Safety (CFS) and three Willamette Valley specialty seed producers have jointly filed suit to stop the ruling from taking effect. A press release on the Center for Food Safety's website posted today states that the ruling allowing planting of canola "would irreparably harm the state’s organic agriculture production and specialty and clover seed industries." If you want to know more or are concerned about this issue, check this list of actions you can take. Read the other posts in this series, Oily Process: Canola Needs Closer Look, Canola Controversy Heats Up, A Voice from the Field, Despite Decision, It's Not Over, ODA Caves to Canola, Write Right Now, Seeding Change and Legislature Passes Ban. 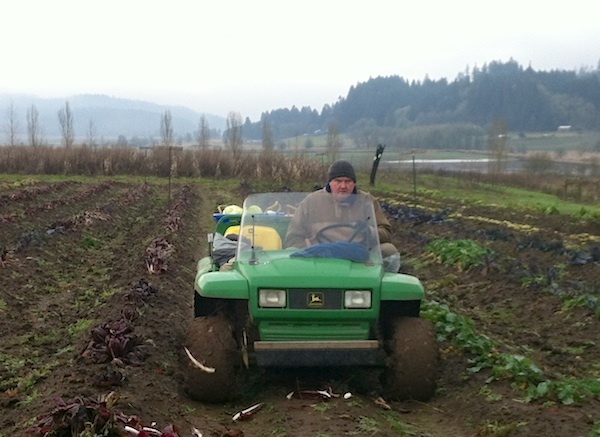 In this interview for Food Farmer Earth, I talk with Garry Hansen of Lady-Lane Farm in Mulino, Oregon. He tells how he almost had to sell his beloved cows but then started selling his milk directly to customers at a farmers' market. Dairyman Garry Hansen was born and raised on his father’s dairy farm in Mulino, and from an early age he loved working with the gentle Jersey cows in his father’s herd. He and his older brother worked on the farm feeding the calves, cleaning pens and helping with milking before they gobbled down their breakfast and ran off to school in the morning. Garry said it taught them responsibility from a very young age, remembering that he also had to come home after school and do chores if he wanted go back for sports practices. His older brother joined their father’s business after graduating from college and Garry followed shortly thereafter, though within a few years it became clear that the business couldn’t support three families. Garry struck out on his own, renting land nearby and starting his own herd of Jerseys and selling their milk to a processor. 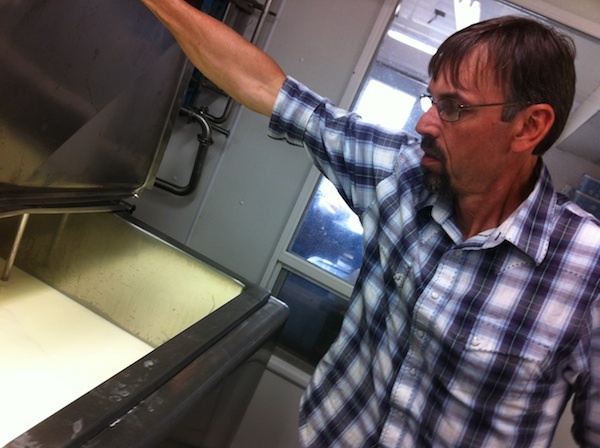 The fact that he couldn’t count on a consistent price for his milk due to the volatility of the dairy market nearly drove him out of business at one point, so to save his cows he decided to investigate becoming a processor and distributor of his own milk. Luckily for him another dairy was selling its equipment at a price that made it possible for him to start bottling. Another stroke of luck came when the old dairy farm next door to his family’s farm came up for sale, and Lady-Lane Farm was born. Read the rest of my story about Garry and Lady-Lane Farm. In this week's cooking segment, learn how simple it is to make Greek Yogurt from chef Tressa Yellig of Salt Fire and Time. To find out more about this series of interviews with local food producers, and to get some terrific recipes featuring the ingredients discussed, consider a free subscription. One of the most impressive and passionate people I've ever interviewed was Frank Morton, a nationally recognized seed breeder and owner of Wild Garden Seed in the heart of the Willamette Valley. In a column in today's Oregonian he discusses why the ODA's unilateral decision to allow cultivation of canola in the valley is a "nightmare." Oregon's Department of Agriculture has made good on its determination to shrink the Willamette Valley canola control district, despite ongoing objections from Willamette Valley specialty seed growers, seed companies, clover growers and the state Clover Commission, fresh-market vegetable producers, organic growers and Oregon Tilth, the state's largest certifier of organic crops. Each group has its own specific objections to canola. These concerns include genetic cross-contamination of specialty brassica seeds, increased insect and disease problems, and weed issues that in turn contaminate clover, grass and vegetable seeds with canola seed that cannot be sorted out from other seed. Organic farmers and certifiers are doubly concerned about the introduction of genetically modified canola, as this opens up multiple routes for contamination of organic foods through seed, animal feed and pasturage. This ODA decision is a turnaround to its 2009 determination that canola production represents a substantial risk to the specialty seed industry in the Willamette Valley, an industry worth more than $32 million with a global reach. After a three-year study involving Oregon State University scientists and specialists in agronomy, weeds, insects, diseases and genetic drift, ODA Director Katy Coba ordered that a protected zone be established to keep canola production out of the area traditionally covered by the Willamette Valley Specialty Seed Association's seed isolation maps and associated rules. The 2009 rule contained a clause requiring the agency to review the rule at the end of 2012. Instead, in spring of 2012 the ODA notified the specialty seed industry that it wished to reconvene the canola advisory committee and hoped to find opportunities for Willamette Valley growers to produce canola within the protected zone. Have any of the hazards of growing canola changed? Read the rest of Morton's column, Canola growing area expands, introducing a seed nightmare to the Willamette Valley. Read the other posts in this series Oily Process: Canola Needs Closer Look, More on Canola: Stakeholders File Suit, A Voice from the Field, Despite Decision, It's Not Over, ODA Caves to Canola, Write Right Now, Seeding Change and Legislature Passes Ban. Top photo by Kathy Freeborn Hadley for the Oregonian. What better way to celebrate a significant birthday than to share favorite memories about the person being fêted? 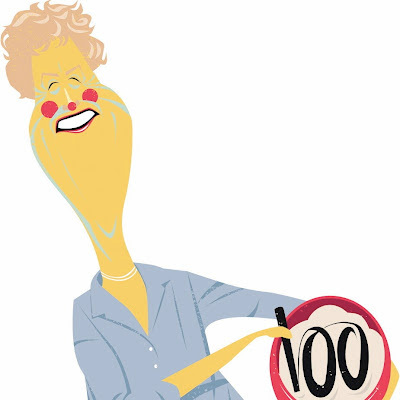 So to recognize Julia Child's 100th, I asked some of Portland's best food writers about their first impressions of her, as well as what influence she might have had on their own cooking and their choice of a career. Best of all, they share the Julia recipes that they can't do without! Illustration by Dave Badders for the Oregonian. 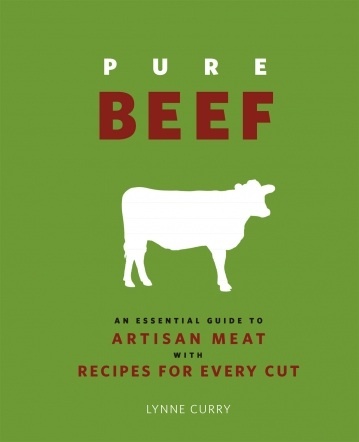 There aren't many events where eating wodges of meat coincides with a book-signing—pristine pages dotted with blood and meat juice spring to mind—but Oregon writer Lynne Curry, author of the newly released cookbook "Pure Beef," is going to do just that. Along with her friend and fellow author Cheryl Sternman Rule and the transcendent talents of chef Anthony Cafiero, she's putting on what's promised to be an omnivorous evening comprised of dishes from her book and "Ripe," Rule's compendium of cooking with fresh, local fruits and vegetables. (You may know Rule from her award-winning blog, 5 Second Rule or the writing she's done for national publications.) In any case, this meal is going to be one you won't forget, whether or not you end up dripping on those pristine pages. 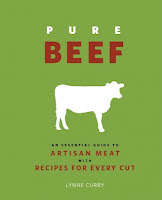 Details: Three-Course Dinner with authors Lynne Curry and Cheryl Sternman Rule and chef Anthony Cafiero. Thurs., Aug. 23, 6-9 pm; $75 in advance, tickets available online. Dinner to be held in ChefStable private dining room, 1223 SW Washington St. 541-263-0347. There are few things that go together better than cake and champagne, and both will be in abundance at the celebration of the release of Julie Richardson's new book, "Vintage Cakes." 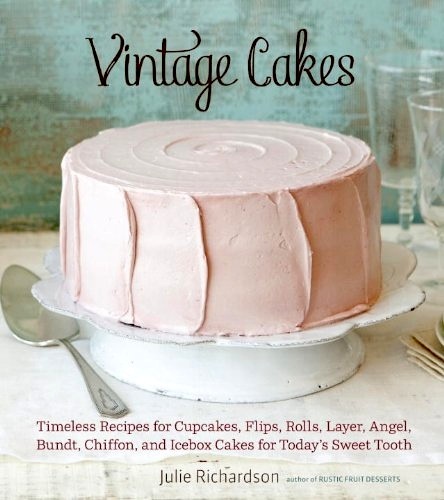 Co-founder with husband Matt of that palace of pastry pleasures, Baker & Spice in Multnomah Village, this to-be-classic contains timeless recipes for cupcakes, flips, rolls, layer, angel, bundt, chiffon and icebox cakes for today's sweet tooth. I'm a huge fan of her first book, "Rustic Fruit Desserts," which vies with a couple of other fave cooking tomes on my shelf for the honor of most well-thumbed. As if you needed more than cake and champagne to draw you in, they'll also be offering 20% off the cover price of both books at the event. 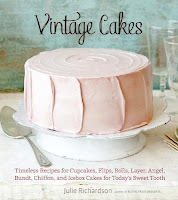 Details: Champagne, Cake and Book Signing for Vintage Cakes by Julie Richardson. Thurs., Aug. 16, 6-8 pm; free. Sweetwares, 6306 SW Capitol Hwy. 503-546-3737. Not to change the subject too abruptly, but there's another event you won't want to miss, and that's the annual "truckload o' albacore sale" at Whole Foods. This year it's called the Dog Days of Summer Street Fair and is happening at the new Hollywood location on Saturday, Aug. 18. You'll have the opportunity to buy whole albacore fish as well as precut loins, plus they'll be offering grilled albacore and Hatch chiles as a benefit for Oregon's pet food bank, the Pongo Fund. To make the "street fair" descriptor complete, there will be artisans from Handmade NW, some favorite vendors, neighborhood pet services and live music, too. The price for the whole albacore will be an amazing $3.99 per pound, with precut loins selling for just $7.99 per pound, so get there early for the best selection! Details: Dog Days of Summer Street Fair at Hollywood Whole Foods Market. Sat., Aug. 18; truckload sale starts at 9 am, street fair from 10 am-2 pm. Hollywood Whole Foods Market, 4301 Northeast Sandy Blvd. on 43rd Ave. between Sandy and Tillamook Sts. 503-284-2644. The Willamette River, from its headwaters in the Calapooya Mountains outside of Eugene to its confluence with the Columbia north of Portland, forms the base of a long narrow valley that not only contains 70% of the state's population, it's also Oregon's most fertile agricultural area. Averaging only 25 miles wide, the valley's rich volcanic and glacial soil was deposited here by ancient Ice Age flooding and can be half a mile deep in some areas. Orchards, vineyards and farmland vie with urban areas for space in its narrow confines, and some crops have been tightly controlled to prevent problems with cross-pollination from the distribution of pollen by the wind, water and dust churned up by traffic along its length. 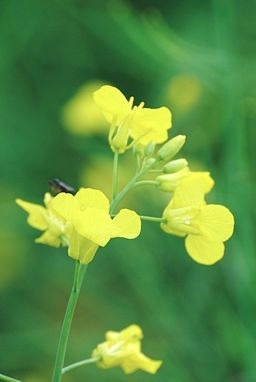 Canola, also known as rapeseed, has been one of those controlled crops and has been regulated in Oregon since 1990. Because it is a member of the Brassica family (Brassica napus, B. rapa and B. juncea), it can cross-pollinate with with similar brassicas like cabbage, broccoli, cauliflower, kale and turnips, endangering these valley crops and the farmers who depend on them for their livelihoods. With the bulk of the domestic canola crop also contaminated with GMOs (approx. 93%), this presents a particular threat to organic farmers and seed producers, since current USDA Organic guidelines do not allow for genetically engineered material. Recently, the USDA deregulated canola production, a move that was pushed by large agribusiness concerns like Monsanto. This prompted the Oregon Dept. 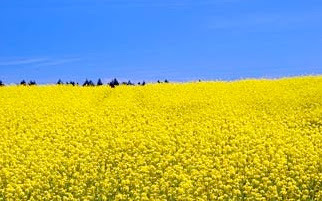 of Agriculture (ODA) to reevaluate its canola regulations, and on Aug. 3, 2012, it issued a temporary ruling to allow planting of the crop in certain formerly protected areas. This decision was made after a working group hit a deadlock regarding the boundaries of where canola can be planted in various protected agricultural areas of Oregon. By taking the decision in-house, the ODA has circumvented regulations requiring input from the public and the agricultural community. The new rule is set to take place this Friday, Aug. 10, though no justification has been made as to why the rule has to be rushed into implementation. A stakeholder letter signed by Friends of Family Farmers, Oregon Clover Commission, Wild Garden Seeds, Fresh Market Growers Association, Oregonians for Farm & Food Rights, National Center for Alternatives to Pesticides, Center for Food Safety, Greenwillow Grains, and Adaptive Seeds asks the public to sign a petition asking Katy Coba, Director of the Oregon Department of Agriculture and Governor John Kitzhaber to halt the temporary ruling process. Read the other posts in this series, Canola Controversy Heats Up, More on Canola: Stakeholders File Suit, A Voice from the Field, Despite Decision, It's Not Over, ODA Caves to Canola, Write Right Now, Seeding Change and Legislature Passes Ban. Photo of canola field in Boardman by Gary Halvorson, Oregon State Archives, via Wikimedia Commons. Canola blossom by Canada Hky (own work), via Wikimedia Commons. A popular saying has it that it takes a village to raise a child. Contributor Anthony Boutard of Ayers Creek Farm tells us that, in many ways, it works much the same way for a farmer. We are suffering the usual grunts and groans as we get ready for the Chesters. A couple of weeks ago, a young heron shorted out the power line to the pumps, frying the controller on our smaller pump. Ernst Irrigation had a used one that worked, and Gerry had it installed quickly. Heron survived, just some singed primaries. One of the indispensable Gators. Then, ten days ago, one of the utility vehicles lost compression, a bad symptom, but we were spared the worst. On the Gator, older models used a plastic camshaft gear. Doug down at Ernst installed a new steel gear and it is running nicely. Early this week, an "alarm 14" on the controller for our big pump used to cool the blackberry field indicated a short in the motor windings, so we had to pull the 600 beast and bring it down to McMinnville. Picked it up this morning. Craig from Ernst got it up and running just in time for the upcoming heat ripple. Funny how mellifluous a 50 HP pump coming up to pressure sounds on a hot afternoon. Despite this tale of woe, we have not retreated from our solemn commitment to bring Chesters and other good food to the Hillsdale Farmers' Market with a cheerful smile. Credit all the good staff at Ernst Irrigation in St. Paul for easing us out of tight spots over the last couple of weeks. The banal bumper sticker reads "No Farms, No Food" which has some measure of truth, but the last couple of weeks drove home the fact that there are plenty of other businesses that are essential for us to bring you food. Any successful business is part of a community and we don't do this alone, despite some of the cramped rhetoric bandied about lately. When you braise five pounds of pork shoulder for tacos and have guests over, no matter how good it is, there's bound to be some left over. At least I was certainly hoping that would be the case. You see, I had this nefarious, yet very simple, plan. It had to do with my recent craving for pulled pork tacos, assuaged by the aforementioned dinner, which had compounded an earlier craving for pulled pork sandwiches. And that's where the planning came in. It went something like this: We'd have pork tacos, necessitating the slow braising of a really big pork shoulder, enough that there was an almost certain likelihood of leftovers. Which allowed the sandwiches room to squeeze in a couple of nights later after the pork had mellowed in the fridge, its sublime flavor getting even better as the ingredients had time to get to know each other. And on the appointed night, voilà! 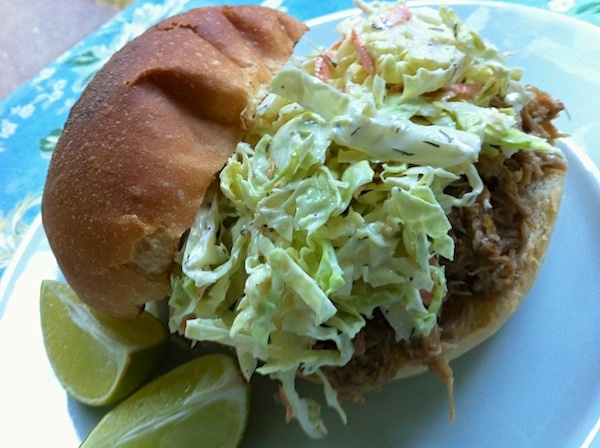 The appropriate elements were gathered—the slaw made, the buns toasted, the pork warmed and the beer poured. All it took was a nefarious, yet very simple, plan. 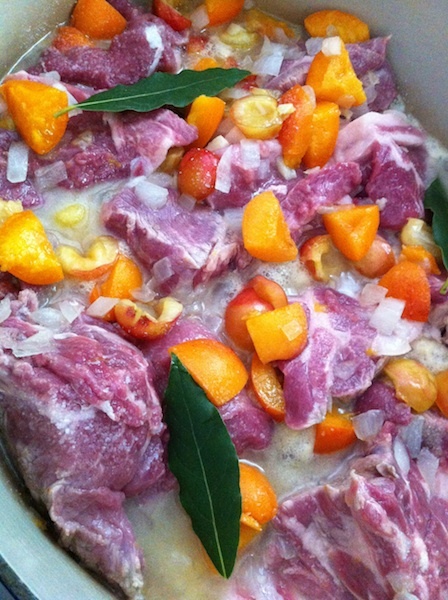 Make the pulled pork as directed, or have a clever plan like I did (see above). Place the shredded cabbage and carrot in a large mixing bowl. In a separate bowl, combine the mayonnaise, vinegar and herbs. Stir until any lumps are gone. Pour over cabbage mixture and stir to combine. Make the sandwiches by putting a good amount of pork on the bottom half of the bun and topping it with a good amount of slaw. At this point you can eat it as is, but some people like to pour copious amounts of their favorite barbecue sauce on it or squeeze some lime on top. Whatever. It'll be delicious no matter what. By the way, The "L" Word refers to leftovers. Why, what did you think it meant? The sun was just past the yardarm as we left lovely Lake Chelan and headed for our weekend getaway in Wenatchee. 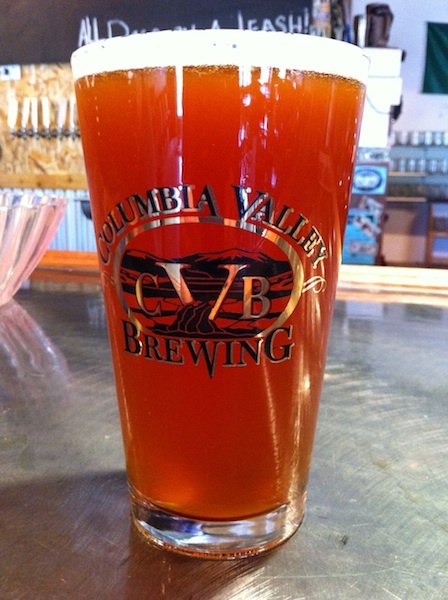 Since we're always ready to check out the local brews of the areas we visit, we stopped at Columbia Valley Brewing hoping for some thirst-quenching action and a nosh or three. Kicking this leg off right…with a pint! With a big patio overlooking the Columbia, the thirst-quenching was there in spades with a selection of everything from Belgian-style ale to the requisite NW IPA to a deep dark porter. The noshing was nowhere to be seen, however, with naught but peanuts on offer. If we'd known, though, we could have brought our own 'cue-able items, since they have a BYOM (bring your own meat) policy and the grills were getting fired as we arrived. Baseball and beer pair well, don't you think? 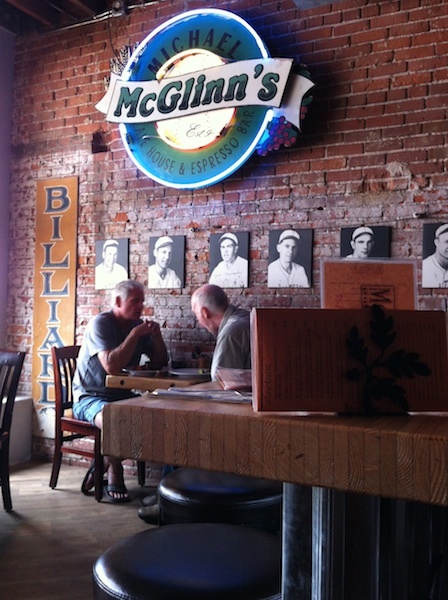 The helpful bar attendant suggested that we try a local hangout called McGlinn's downtown for lunch. We arrived to find a piece of local history that was as lively as when it was the Orando Recreation Club in the 1920s. Originally housing railroad and dam workers on its top two floors, in the 30s and 40s it was home to the players for the Wenatchee Chiefs baseball team. Much of the team's equipment and memorabilia was left to molder in the building's basement when they moved out, to be found decades later by the owners who were restoring the building. That history is now on prominent display and can be enjoyed with local brews and the offerings on the wide-ranging menu. Artisan cider is a new crop for the area. After checking in to our room at the zoomiest Marriott I've ever seen, with its Jetsons-like (and very un-Wenatchee) decor, it was time to head out to Kyle and Marcia Green's Cashmere Cider Mill for a taste of their Lady Blush artisan ciders. 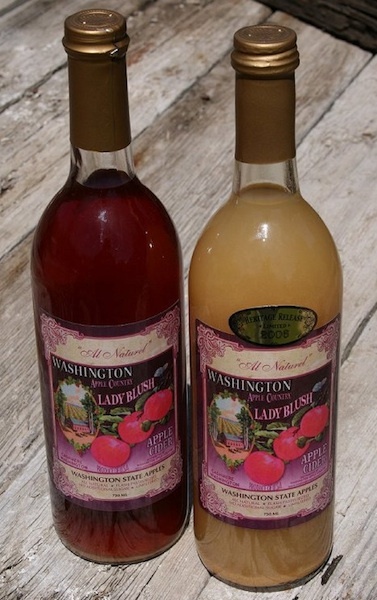 Washington apples are pressed in a machine designed by Kyle himself, then combined with other fruits like raspberries, blueberries, huckleberries and even lavender to make their nonalcoholic ciders. The Greens also provide guest suites in the historic farmhouse on the property (top photo shows a view from the back porch), and if you're looking for a quiet country getaway, this would be a good choice. 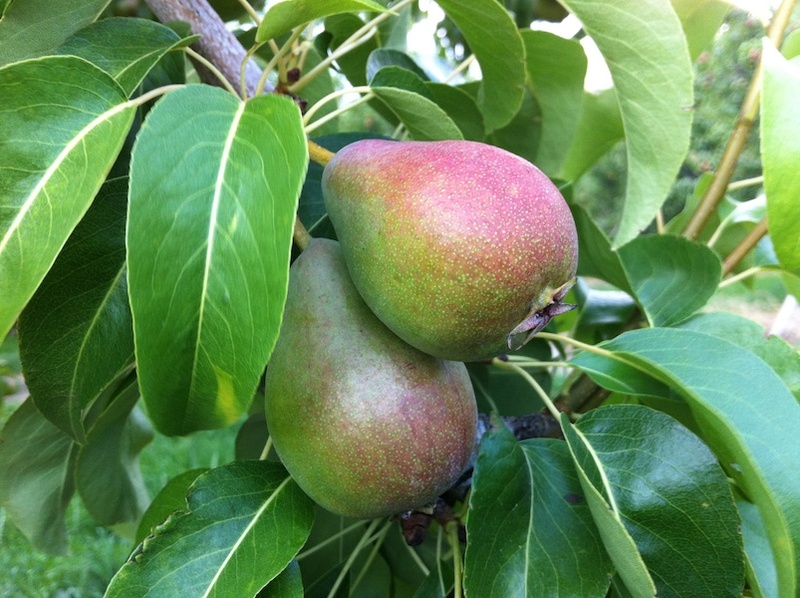 Orchard country means pears, apples and cherries. 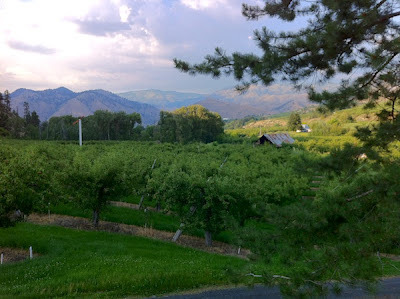 As mentioned in my post on Chelan, this area was home to a booming orchard industry in the last century. Like BC's Okanagan, it's been discovered by winemakers and vineyard developers, with many old orchards being ripped out to plant grapes. Fortunately for some, though, the region is also discovering the benefits of hard ciders made from their apples, so land that may not be conducive to growing grapes is finding a new outlet for its famous crop. Peter Ringsrud of Snowdrift Cider. 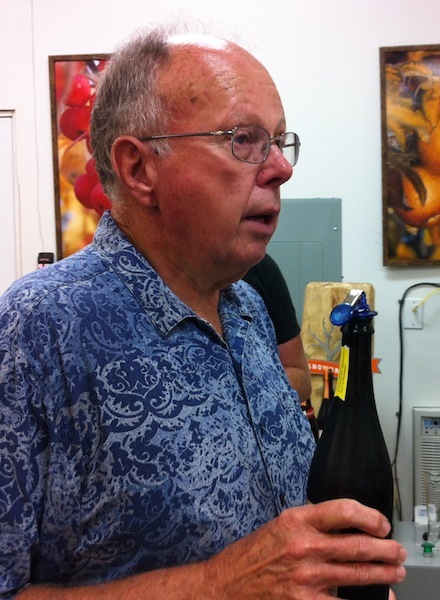 We visited one of these hard cider producers, Peter Ringsrud of Snowdrift Cider, whose family has roots in the Wenatchee Valley going back to the 1940s. With memories of the hard ciders his family had made with a hand-cranked press and glass carboys, in 2003 he and his wife decided to try their hands at making hard cider. Discovering that the family's cider had been made from heirloom French Calville Blanc d'Hiver, and then researching other cider apples, by 2009 they had built a small micro-winery and obtained a license to produce hard ciders that are now beginning to attract serious attention. Organic is Greg McPherson's thing. 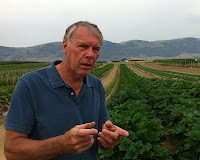 Just down the road from Snowdrift was the farm of Greg McPherson, a jovial raconteur who loves to talk about his large organic farm, Tiny's Organic, which he runs with his daughter, Erin, and two sons Jay and John. Supplying enough for 30 or so farmers' markets in western Washington, the farm also offers a significant number of CSA shares with a dizzying variety of membership options. They were harvesting cherries the day we were there, and it was a pleasure to walk through the grass under the trees and pick the (unsprayed) cherries right off the branches. 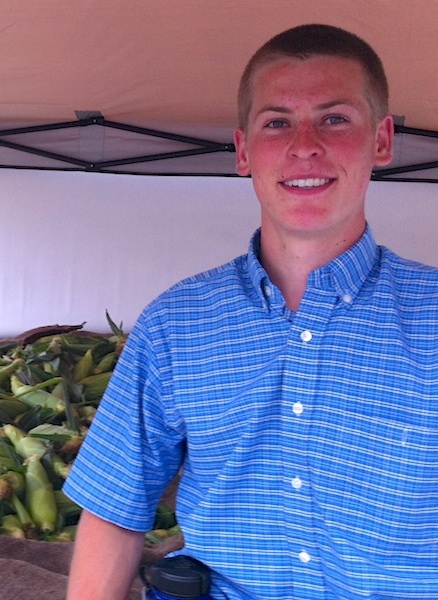 Farmer Grant Kallstrom at Wenatchee Farmers' Market. As luck would have it, the Wenatchee Farmers' Market was in full swing when we returned from Tiny's, so of course I had to do a walk-through to check it out and, yes, sample some more of the delicious cherries. The market's a bustling place and so popular with local shoppers that it runs three days a week during the harvest season, with morning markets on Wednesday and Saturday and an evening market on Thursday. In addition to the cherries there were beans, greens, a few early tomatoes and a trailer-load of fresh corn…unfortunately our room at the Marriott didn't have a kitchen or I would have been tempted to grab some and have dinner in. Brewer Jason Doten of Saddle Rock. Another lucky break? Right next door to the market was brand new Saddle Rock Pub and Brewery, named after a Wenatchee landmark known for its crazy biking trails and fabulous views. The pub has a dozen brews on tap at any given time, along with a few hard ciders. It's soon to be offering…licensing was mere days away when I was there…a selection of beers made by owners Chadd Fitzpatrick and Jason Doten. A casual place to sip beer and hang out, it's right downtown with a view of the historic river district. What's also impressive is their dedication to making their pizzas and salads with as many local ingredients as they can, and from the sampling I had the food alone is worth stopping in for. We didn't have time this trip to visit Bavarian-themed Leavenworth just up the road or the slew of wineries that dot the valley, but theyll certainly be drawing us back for another exploratory road trip. Read about the first leg of this road trip in Dipping Into Chelan.